Interfacing Technologies has announced that it has received an honorable mention by Gartner, the world’s leading information technology research and advisory company, in its recently released Magic Quadrant for Business Process Analysis (BPA) Tools report. 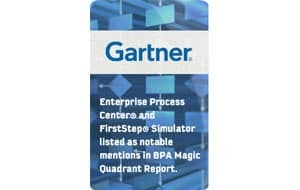 The report lists Interfacing’s Enterprise Process Center® and FirstStep® Simulator as notable mentions in the BPA-related products category. “Some vendors do not cleanly fall within the BPA market categories… but are worthy of mentioning based on their products, features and customer feedback”, states Gartner. Interfacing is honored to have two products listed by Gartner. Interfacing has evolved its product offering to include much more than a pure-play BPA with the Enterprise Process Center®; a full Business Process Management Suite (BPMS). EPC offers strong core BPA components, with capabilities that go well beyond modeling and analysis to satisfy a wider-range of process lifecycle management, business architecture, automation and GRC corporate needs. Process modeling as part of BPA is becoming a starting point for a growing number of business process management (BPM) and compliance projects, and helps avoid the rush to execution that often results in poor BPM ROI or failure” states the report. Interfacing has been following this approach for years, and it’s evident from Gartner and the increased demand for enterprise process management tools, that many companies moved too hastily into workflow projects and are now taking a step back. Interfacing Technologies Corporation is a pure-play Business Process Management software and services provider with over twenty years in the space. Interfacing has clients globally across all industries and is well recognized for their personalized customer service and 24x7 support via their international office locations. Interfacing’s BPM solutions are intuitively designed for business users and cover the full spectrum of process improvement and governance initiatives. Multiple groups within the organization can collaborate and conduct diversified programs in parallel for business architecture, lifecycle management, automation, risk management and compliance, all within the same centralized process repository. Interfacing delivers the knowledge and puts the tools in the clients’ hands to continuously improve operational performance and align their business objectives and GRC strategies with daily operations.